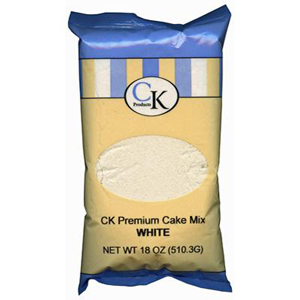 Brand: CK Products 77-502 Units: 18 oz. bag Great tasting cake mix! Add water and oil; mix and bake to create an easy cake at home. Instructions printed on packaging. Great tasting cake mix! Add water and oil; mix and bake to create an easy cake at home. Instructions printed on packaging. Ingredients: Sugar, Bleached Enriched Wheat Flour (Wheat Flour, Enriched with Niacin, Reduced Iron, Thiamine Mononitrate, Riboflavin, Folic Acid), Vegetable Shortening [Soybean Oil, Vegetable Mono and Digylcerides, Propylene Glycol Ester, Soy Lecithin, Tocopherols (Vitamin E), Vitamin C Palmitate (as Antioxidants)], Dried Egg Whites, Leavening (Sodium Bicarbonate, Sodium Aluminium Phosphate, Monocalcium Phosphate, Dicalcium Phosphate), Nonfat Dry Milk, Dextrose, Food Starch-Modified, Salt, Artificial Flavor, Sodium Stearoyl, Lactylate (Dough Conditioner), Cellulose Gum, Locust Bean Gum, Guar Gum, Xanthan Gum.